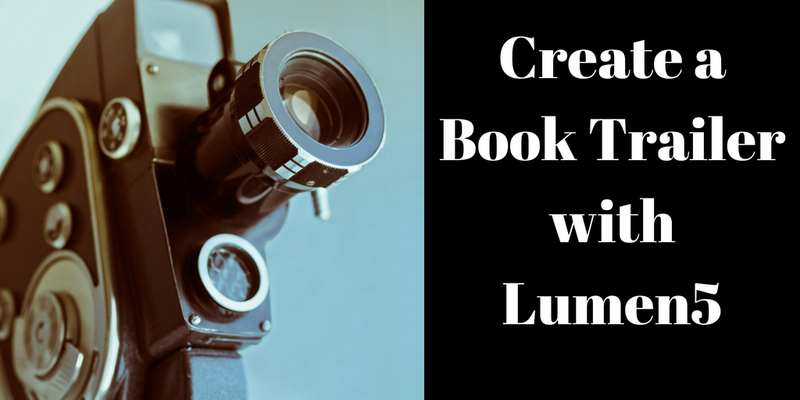 Today, I’m going to look at using Lumen5 to create a book trailer. Interest in using book trailers to market indie author publications seems to wax and wane in marketing discussions. Initially all the rage, I’ve noticed a lot less buzz about them over the last year. There are several reasons for this — they cost money and time to produce, indie authors are writers, not video production specialists, and tools to create them must be mastered. The time involved can better be spent writing, it’s thought. 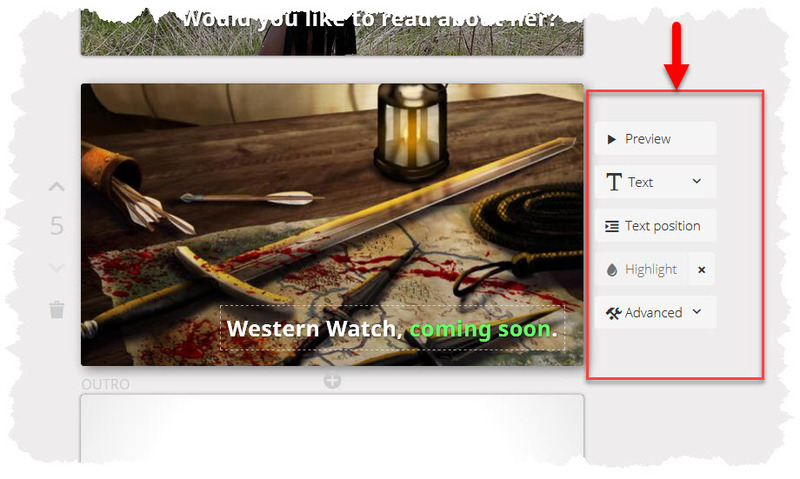 This post addresses the last point — new tools have become available, some not specifically designed to create book trailers. One such is Lumen5. This post asks and answers the question — can you create a book trailer with Lumen5? 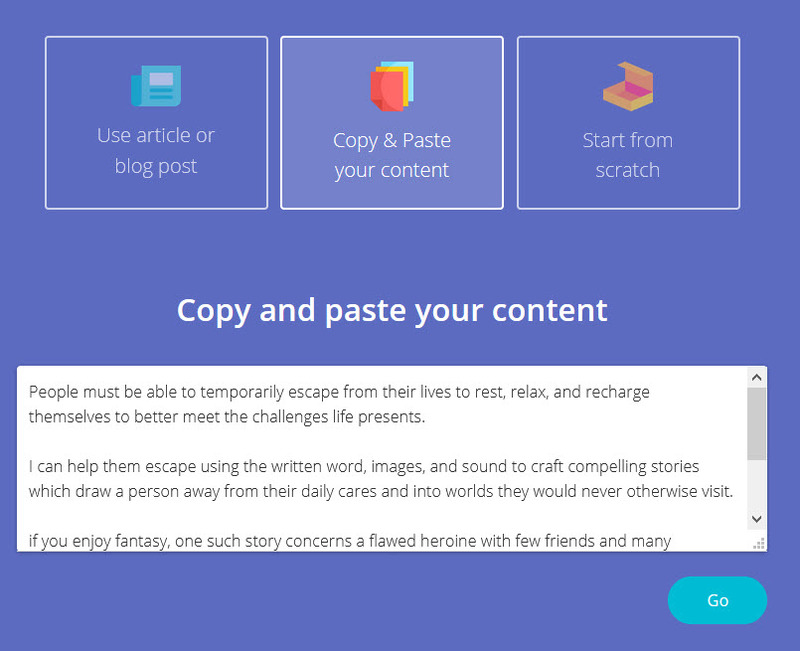 Lumen5 is a web-based application designed to take text (usually a blog post) and turn that text into a video with text, graphic assets, background music and more. Lumen 5 produces a video with selected text content from a blog overlaying still images or short video clips. The video is assembled as a series of slides that are then published in MP4 format. Lumen5 is free to use, and subscriptions offering more features are available. I’ve already posted on Lumen5 in detail here and here and I recommend reading those articles for more in-depth information. To answer the question of whether a trailer can be produced using Lumen5, let’s make one! You can find in-depth discussion of all these points in my Let’s Make a Book Trailer series. See Part 2 for information on trailer types and digital assets, and Part 6 for information on scripting. In this post I’m going to make a teaser trailer — one to inform and build awareness rather than one with a specific call to action (i.e. purchase a book). Lumen5 comes with royalty free digital assets and, of course, is the tool I’m going to use. Thus many of the points identified above are already addressed. The only outstanding item is writing the script. Scripts can be quite elaborate scene-by-scene breakdowns, with graphics and music identified, and narrative issues (e.g. pacing) taken into account. Lumen5 emphasizes fast production and ease of use, so our script is going to be simply one line of text for each of the slides we create. The script can be written in a separate application such as Notepad or composed directly in Lumen5. I’ll compose the script in Notepad and then just copy and paste it into Lumen5. People must be able to temporarily escape from their lives to rest, relax, and recharge themselves to better meet the challenges life presents. I can help them escape using the written word, images, and sound to craft compelling stories which draw a person away from their daily cares and into worlds they would never otherwise visit. if you enjoy fantasy, one such story concerns a flawed heroine with few friends and many enemies fighting for her life in a world of steel, leather, and horse. Would you like to read about her? The script is a minor re-working of my author message, developed in this post using Simon Sinek’s idea of the golden circle in communication. You can see this is a teaser script in that there is no direct call to action (mostly because Western Watch — Lady Merreth’s novel is only on the third draft. Yeah, gotta get on that.). Lumen5 has a large selection of royalty free images and video clips you can use in your book trailer. It will suggest some images immediately upon processing the uploaded text. It does this by scanning the text for key words and then suggesting images which — I presume — have been tagged with such words However, image suggestions will likely need to be tweaked. For example, the first image selected by Lumen5 for my book trailer appears to be a protest scene with gun issues at the forefront. This is a little too dark for my tastes so I swapped it out for a more generic crowd scene from Lumen5’s library. You can search for images (and videos) supplying a key word. Filter results by image, video, or icon. Scroll through results and merely drag the desired item on to a slide on the right. Repeat this process for however many slides whose visuals need to be tweaked. Of course Lumen5 may not have the image that you need. You can upload your own (make sure you have permission to use the image) and insert as required. I did this for one of slides in the video, using an image I commissioned from an artist — S. Yoshiko. Trailers usually have text somewhere, if only in the call to action at the end. By default Lumen5 places text on every slide — remember Lumen5 is NOT a trailer application, it’s a blog-to-video application. You can remove the default text entirely, edit it, and/or add new text. There is a limited capability to change text position — usually done so it doesn’t “get in the way” of the background image. Other options with which you can experiment also exist. Most trailers need music and Lumen5 supplies a number of royalty-free tracks you can use. 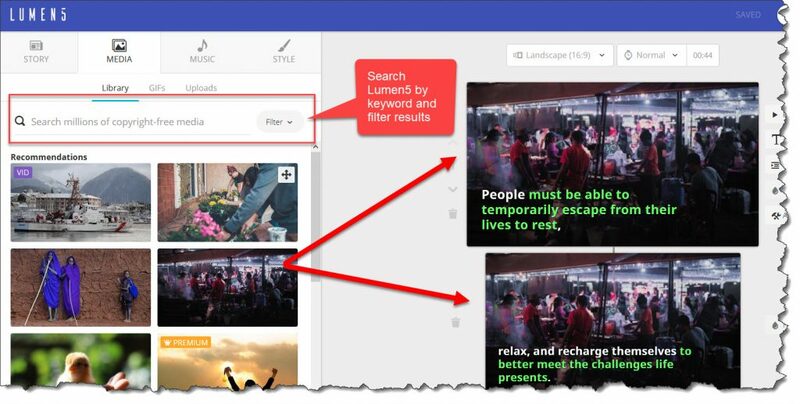 As with images and videos you can search by key word and filter results, this time by mood. Make your selection to add the track to the trailer. Note there is no “tweaking” available: you cannot loop a track, nor can you modify the track to precisely fit your trailer duration. Longer tracks will merely cut out at the end of the trailer. Of course, if your trailer does not require a music track, there’s no need to use any of Lumen5’s functionality. 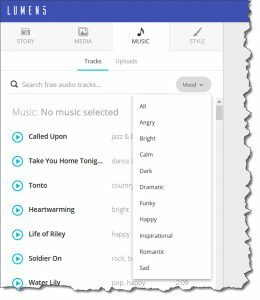 Finally, as with images and video, you can also upload your own music track. Again, make sure you have the right to use the track. Lumen5 automatically adds a slide at the end of your trailer where you can upload a logo — if you have one. Lumen5 calls this slide an “outro”. I don’t have a logo so I just uploaded another image I have commissioned. You can see that the “logo” is vastly reduced in size compared to the other slide images. A “full size” logo image requires a paid subscription. You have the option to delete the outro slide completely if you want. For this example, I will leave the slide in. Lumen5 gives you a number of options to adjust the look of your trailer. You can select from a limited number of text transitions, slide transitions, and text highlight colours. You can also change the font. When you are happy with the trailer you can have Lumen5 render the video. The free version only provides 480p rendering, you’ll need to purchase a paid subscription for better resolution options (and other features as well). Rendering can a while. My 44 second trailer took five minutes to complete. Lumer5 sends you an email when the video is rendered. You can then download the MP4 file or post it directly to FaceBook. You can judge for yourself whether you think the trailer meets the objective of a teaser trailer. Lumen5 is very easy to use, which is both a strength and a weakness when it comes to using creating a book trailer. Limited features and capabilities mean a smaller learner curve. Moreover, Lumen5 was not created for book trailer or other video production. It’s meant to take blog text and convert it to video (which it does very well), so we’re using the tool for purposes for which it was not designed. Lumen5 is, in my opinion, capable of producing an indie author’s first experimental book trailer(s). It provides a no-cost solution for the author who is not well versed in video creation and short on time. I think these “experimental” book trailers allow an author to see what is possible before make a serious investment of time and money in such a production. So what about it, readers? Do you think Lumen5 can be used to create book trailers? Let me know in the comments! Thanks for reading and I will see you again next time.